As a number of members had recently already tackled Ben Donich (under duress in conjunction with the Brack!) 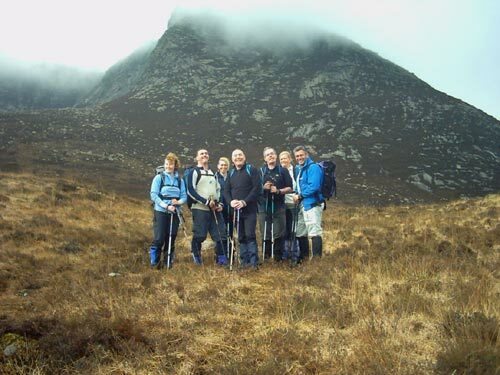 they decided on an impromptu visit to Arran to join Chris and Andy on their reconnaissance of the eastern ridges of the Northern Granite Massif from Cioch na h Oighe via North Goat Fell and the Stacach Ridge to Goat Fell, which they plan to do as part of their Nepal trip reunion. As ever the day started with a bleary eyed start to catch the 7:00 AM boat and then the bus to Sannox, where we set off up the glen for approximately 1 km before breaking off on another path up over the hillside towards the Devils Punch Bowl. 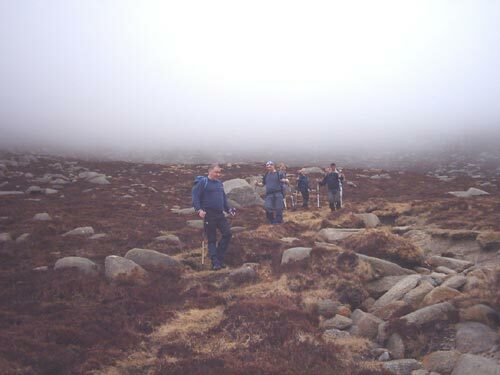 We veered off this path to reach another this time making for the North East Face of the Cioch na h Oighe ridge which was duly "Marked" by Chris on the GPS so on the return trip it could be easily found in the mist, only to note that it should up as being 42 km away! On continuing up its steep heathery slopes I tumbled about trying to work the GPS and not trip, with the technophobes cliché in mind - "RTFM"! However, I soon managed to sort out the gismo and marked to too necessary points in time to start the best part of the day, the scrambly bits! This is what I really enjoy about hillwalking, when you need your four-wheel drive - hands out of the pockets and on the rocks! And it even hadn't started raining yet as Kathryn assured us it wouldn't. 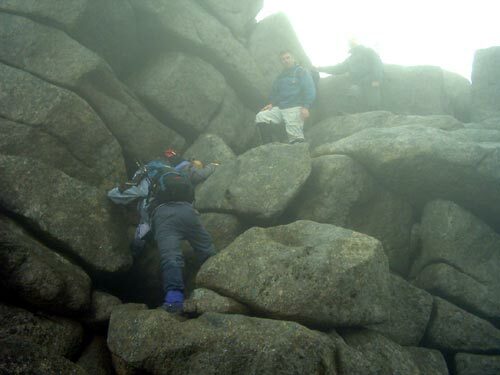 We continued up this enjoyable section to reach the top and catch a glimpse of, yes that's right absolutely nothing! Typical Scottish weather yet at lease it hadn't started to rain, Kathryn assured us it wouldn't! 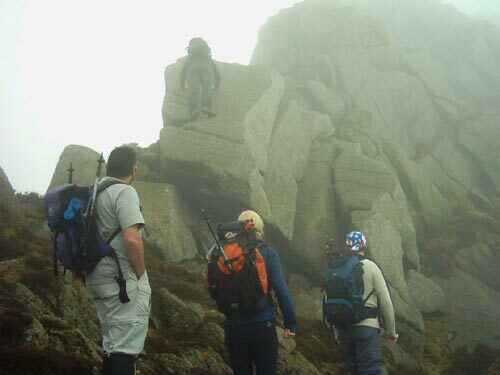 The mist however, added an atmospheric air as we continued along the ridge, which may have helped those members of the party with a reluctance of exposed places yet at lease it hadn't started to rain, Kathryn assured us it wouldn't! 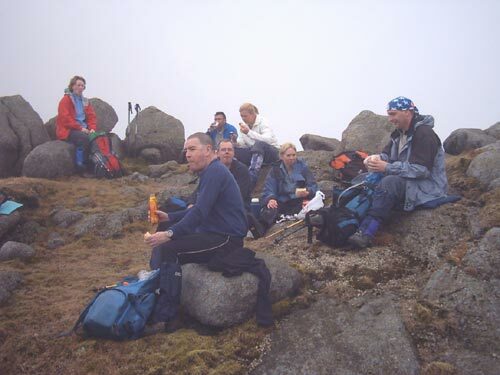 We continued up to the summit of Mullach Buidhe, where we rested, had lunch and Chris suggested that Kathryn could replace "Heather the Weather" as her predictions were just as incorrect as the rain started. 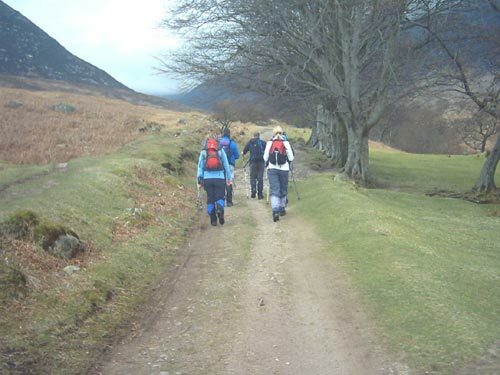 We continued down from Mullach Buidhe and up to North Goatfell, which proved to be a shot sharp, pull with everyone feeling the burn in their thighs, probably from the build up of lactic acid that had gathered during lunch. A short discussion followed as to whether we should tackle the Stacach Ridge in the damp conditions, yet Kathryn assured us it wouldn't rain! But this only took two seconds as someone insisted that he was doing it, which was the end of the discussion! Care was taken however, as the rock was damp, yet Kathryn assured us it wouldn't rain! We cautiously scrambled over the next part of the ridge, which relied on more counter balancing climbing techniques, rather than pulling up on hand holds as the large granite blocks were rounded in nature. 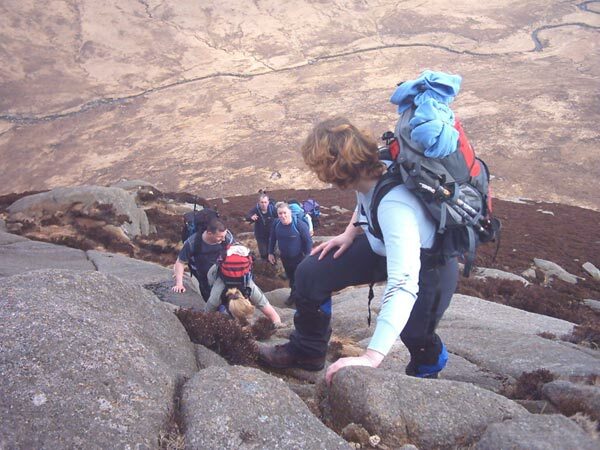 At this point we met our fist other walkers of the day only to be swamped by the hoards of Easter tourists by the time we made the top of Goatfell. 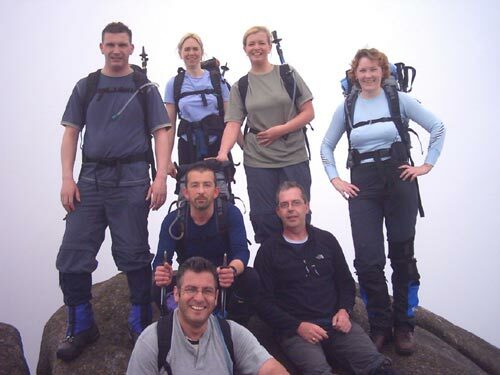 Being antisocial and not wishing to hang around at the top with the tourists and the smell of alcohol looming from down below in Brodick, Alan suggested we take the direct decent down the coire avoiding the continuing snaking line of tourists still on accent. This was a quick decent which saw the now normal transformation of Caroline into a gazelle as she skipped down ahead of the pack to rejoin the path further down the hillside. 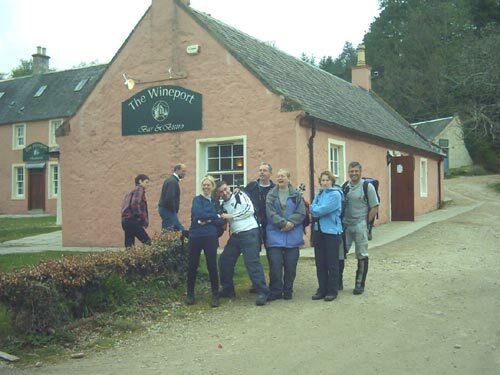 Now on the final leg of the journey and with a recently improved path in front of us the lads took it easy while the lassies must have had smelt the beer as they vanished in front of us only to be reunited in the Wine Port at the bottom of the hill, and they hadn't even got the beers in! After a quick thirst quencher it was discovered that there was only two cans of cider in stock so as Carol-Ann was starting to hyperventilate at the thought of going without we headed out in true purist mountaineering form to catch the bus back into Brodick and set-up base camp in the Arran Hotel where medicinal refreshments could be had by all. In true Arran style a final dash had to be made from the chip shop with a short order of food to catch the boat back. Many thanks to the weather girl as it was only a short spell of Scottish smir and well worth the trip. Looking forward to tackling the A'Chir Ridge very soon.